The dust is still settling after the trade deadline frenzy, but the season goes on. With the Diamondbacks (59-49) only a 1/2 game back and breathing down their necks in the NL West, the Dodgers (59-48) look to rebound against the Brewers (62-47) to wrap up the month of July. After nearly getting no-hit on Sunday in Atlanta and dropping the series opener at Dodger Stadium to the Brewers on Monday, LA looks to Walker Buehler to end the month on a winning note. The Dodgers acquired Brian Dozier from the Minnesota Twins this morning, another offensive weapon injected into an already stacked lineup. Even though Dozier has had a down year with the Twins, there’s no question it’s an upgrade at second base. Logan Forsythe, still a solid defensive player, has struggled offensively since joining the Dodgers. This year he hit .207 with two home runs in 193 at-bats, approaching 2010 Garrett Anderson status (.181 in 163 at-bats). Logie Bear will get more playing time with Minnesota where, perhaps, he can find some rhythm at the plate. The Dodgers gave up two prospects in the deal. Luke Raley (OF/IB) and Devin Smeltzer (LHP) go to Minnesota in what looks to be a very good deal for the Dodgers. John Axford will be Rick Honeycutt‘s project down the stretch. He was very good for the Brewers back in the day, but he was absolutely horrendous last season with the Oakland Athletics (6.43 ERA, 5.73 FIP, 2.095 WHIP, 7.3 BB/9). He hasn’t been quite that bad this year with the Toronto Blue Jays (4.41 ERA, 4.02 FIP, 1.255 WHIP, 3.5 BB/9). Let’s see if Honey can work his magic. I was skeptical about Tony Cingrani and Tony Watson at this time last year as well. The Dodgers sent minor league right-handed pitcher Corey Copping to the Jays in return. The Dodgers’ trade deadline reinforcements do seem underwhelming considering there were arms to get out there. Alex feels underwhelmed as well. I’m still thankful they didn’t go all out, Pirate style, and trade away too much talent. I’m also pleased that, despite the yearly incessant rumors, Yasiel Puig hasn’t been traded away. So we move on to our regularly scheduled program. Buehler (4-3, 3.92, 3.34 FIP) hasn’t completely settled back into the rotation after his season was derailed by a rib injury. Last time out he was roughed up by the Phillies and allowed five runs on five hits on 90 pitches, and he couldn’t get out of the fifth inning. Perhaps he’ll settle down at home where he’s pitched very well this year. He’s held batters to a .209 average at Dodger Stadium in seven games (six starts). Buehler has never faced the Brewers. Old NL West foe Wade Miley (1-1, 2.01, 3.97 FIP) knows the Dodgers well. Overall, he’s 3-5 with a 3.86 ERA vs. LA in 14 career games (13 starts). He’s allowed 14 home runs against the Dodgers, the most he’s allowed against any team he’s faced in his eight-year career. But Miley’s also never lost a game at Dodger Stadium and is 3-0 with a 2.41 ERA and five homers in six career games. Matt Kemp has hit two home runs against him, and Manny Machado is 4-for-10 (.400) with a home run against the southpaw. Miley’s only pitched in five games this season with the Brewers, starting three games since returning from the DL with an oblique injury. We know how long oblique injuries can take to fully heal, but he’s pitched relatively well since coming back. He allowed two runs on six hits with one strikeout and two walks in five innings in a no-decision against the Giants last time out. The Dodgers should exercise their patience at the plate since Miley has an atrocious 12:13 K:BB despite his gleaming 2.01 ERA. 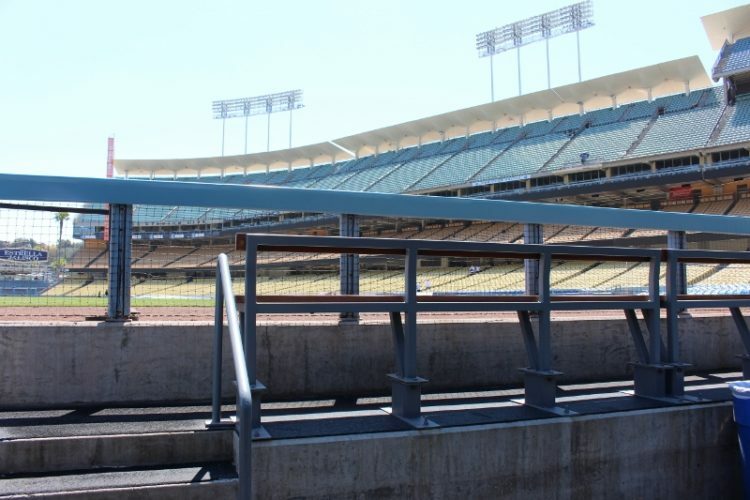 Dozier will arrive at Dodger Stadium at some point during the game. Dave Roberts could use him off the bench tonight. Enrique Hernandez gets the start at second base tonight. Dozier will be in uniform for Dodgers tonight. Axford won’t be activated until Friday. Roberts said that Axford will get to L.A. on Friday, will be activated then. The Brewers also made a trade just before the deadline, acquiring infielder Jonathan Schoop from the Baltimore Orioles. He’s not in Milwaukee’s lineup Tuesday either. The Brew Crew are definitely a different looking team than the one the Dodgers faced last week in Milwaukee. They acquired Joakim Soria, Mike Moustakas and Schoop. As we saw from the series opener Monday night, they’re a good team. The Dodgers are 16-9 this July and have hit 33 home runs, second-most in the NL. That’s a significant cool-off from the month prior, a record-breaking June when they slugged 55 homers in 26 games. Dozier has 16 home runs on the season, and I’m looking for him to hit more Dongz (?) for the Dodgers. They have a plethora of position players – power hitting position players – but the bullpen is still a work in progress. 55 games remain in the regular season. Let the Dozier era begin.